Graduation sampler to commemorate a milestone event. This finely detailed design has a decorative border with scrolls in rich mauves and greens with silver and gold metallic threads to add a special glint. The motifs are of gold embossed books, a mortarboard, and a scroll with a tassel. Graduation sampler to commemorate a milestone event. A scroll border surrounds gold embossed books, a mortarboard, and a scroll in rich mauves and greens. 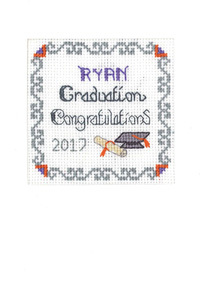 This Graduation Sampler cross stitch kit has only top quality materials; Zweigart fabric, DMC thread, gold and silver thread, needle. A full alphabet is provided for you to add the name of the graduate and the year. 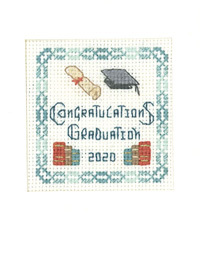 This Graduation Sampler design is part of the Decorative Textiles collection.